Another bright sunny afternoon and another few hours detecting yesterday. I decided to access the land from the other direction, with a view to detecting at the far end of the permission. From the road the field slopes up to a ridge and then down again to where I had been detecting on other recent visits, but the ridge area had been churned up by cattle and was rather boggy so I ended up back more or less where I’d been detecting previously. I wandered along the upper edge of the field, down the slope along the line of the old footpath/hollow way and back along the bottom edge. There must be something about the geology of the field as the lower slopes are noticeably better drained than the top. Once again, finds were sparse. The lead disk gave a cracking signal and as it appears to be completely plain I assume it’s a weight of some sort. An iron ring. Also a cracking signal. I’m tempted to send this to Ged (PeaceHavens) for his collection. 2 pieces of flint which came from a hole in which the signal came from a piece of nondescript metallic scrap. Another fragment of a die cast toy, this time what appears to be the seat of a vintage car. All of the finds except for the iron ring came from the line of the footpath, and the toy fragment was found only 15 yards or so from the one found last week. The two pieces of flint fit together perfectly so obviously came from a single piece. It’s nothing I can put my finger on but there’s something about them that doesn’t look entirely natural so I will be showing them to the FLO next month. One piece in particular looks as thought it might have been intended as some sort of boring tool, but what do I know? It was noticeable how much the days are drawing in now. Although sunset yesterday was officially at 16.18, the sun had dropped below a bank of cloud shortly before 4pm and the light was already fading perceptibly by then. In another month it will be setting well before 4pm so either morning or afternoon sessions are going to be short ones unless I start taking sandwiches as well as a flask of coffee and eat lunch in the field. Roll on spring. Finds: 1 lead weight, 1 iron ring, 2 pieces of flint and a piece of a die cast toy. The promise of a mild, dry and fairly sunny afternoon coaxed me out for another digging session yesterday. This time I headed straight to Field 3 with the intention of detecting a section of the footpath up the slope. The first few signals were a couple of long, hollow iron bars which I assume once formed part of a gate. Unfortunately they both gave too good a signal to risk leaving them in the ground but at least they were easy to find and dig out. The first good signal of the day was another cartwheel penny. The one found earlier this week turned up on the footpath across the neighbouring field; today’s also was found on the footpath, some 20 yards away from the first. I can’t help wondering if both coins were lost on a single occasion by the same poor sod. Maybe that was all of his beer money for the week. Today’s penny was also in poor condition and once again Britannia seems to have survived better than George III, of whom nothing can be made out. The flat-bed part of a broken diecast toy, which might have been a farm trailer or the articulated part of a lorry as one pair of wheels may originally have pivoted. The lid from a tin of Kay’s Compound Pastilles (price 1/11 or 9.5p). The Kay Brothers of Stockport seem to have been manufacturing their various remedies between 1870 and 1880, though possibly also before and/or after those dates. A complete tin, showing what it originally looked like, was offered on Ebay several years ago. He said there is an oral tradition, via a local 90-year-old, of a “monastery” over towards the same area in which the landowner had previously mentioned a “graveyard”. It looks like another trip to Warwickshire archives to look at the old large scale parish maps. There is certainly nothing on ARCHI or the National Heritage List to suggest the presence of a religious house of any sort, so it may be a romantic fantasy or, at best, some vague folk memory of a 14th century swivel-eyed ranty hermit in a tumbledown shack. 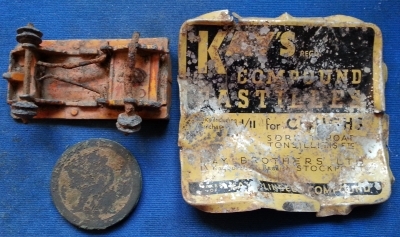 Finds: 1 cartwheel penny, 1 broken diecast toy vehicle and 1 lid from a tin of cough pastilles.